The mission of Dr. Lamberton’s dental school, Loma Linda University, is “to make man whole.” This means that all functions and systems in the body are interconnected, including the relationship between oral health and medical disease. This principle guides Dr. Lamberton’s practice. As dental professionals, we likely see our patients more often than their doctors do. That puts us in an exceptional position to screen for some illnesses that can cause changes in oral health, like diabetes, cardiovascular disease, and oral cancer. Recently our team received training in diagnosing a new specialty: identifying oral health markers of sleep and airway issues such as snoring and sleep apnea. We examine portions of the upper airway, including the mouth, jaw, nasal passages, tongue and throat to help screen for these issues and make the proper referrals for treatment. While we do screen, only a medical doctor can make an official diagnosis. Sleep-disordered breathing occurs when your sleep pattern is broken almost every night. Compensating to open your airway can leave you exhausted the next day and stress the body’s organs, resulting in such health concerns as high blood pressure, migraines, gastrointestinal disorders, autoimmune diseases, and depression, to name a few for which a sleep diagnosis is often missed. Insufficient ventilation: The patient’s breathing becomes shallow, decreasing airflow and dropping oxygen blood levels. What do we look for to alert us to a sleep issue? Worn tooth surfaces caused by grinding or bruxism. If we suspect you have a sleep breathing issue, we may order a sleep study, which can be done either at home with a home sleep test or in a laboratory overnight. You can also track your sleep at home with free Apps like SnoreLab, or with devices like the Apple Watch or FitBit. Videotaping a sleeping person at night can also be revealing. This data can tell us if a more in-depth test is needed. 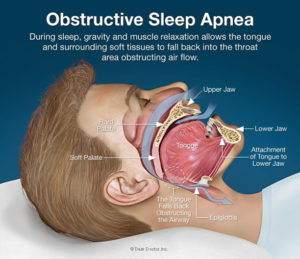 Sleep apnea: characterized by loud snoring, choking noises and pauses in breathing leading to oxygen deprivation. Sleep apnea can be mild, moderate or severe, depending on how many episodes occur during the night. This score is called the Apnea Hypopnea Index or AHI. Upper airway resistance syndrome, or UARS: often called the “young, fit, female disease.” It is characterized by narrowing of the airway without cessation of breathing. This leads to poor sleep and daytime fatigue because the body compensates to open up the airway. It is difficult to diagnose because traditional sleep studies look for apneas and hypopneas only. Also, these patients tend to be young and of healthy weight, so doctors might overlook a sleep disorder as the cause of their ailments. Insomnia: trouble falling or staying asleep. Life stressors can cause insomnia, of course, but it can also be seen in conjunction with UARS. Restless leg syndrome (RLS), narcolepsy and REM sleep behavior disorder. 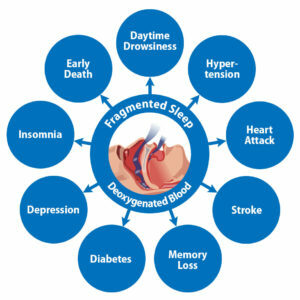 There are many reasons a person may develop sleep apnea and similar sleep disorders. Some of the most common are weight gain, large tonsils or adenoids, respiratory problems such as asthma, allergies, COPD, nasal obstruction, a narrow palate leading to reduced room for the tongue and smaller nasal passages, and loss of tone in the airway and tongue muscles. Night Guard – Worn during sleep, this device can help prevent tooth grinding and open the bite to give the tongue more space, which can improve mild sleep breathing issues. Palatal expander – Attached to the teeth, or in some cases the palate itself, this device can widen a child’s upper jaws to correct occlusion issues such as crossbite, crowding and impacted teeth. It is important to begin this treatment as early as possible in childhood, while palates are still malleable because adults’ palates fuse and don’t respond readily to these appliances without surgical intervention. Palatal expanders can be an important component of treatment to reduce sleep apnea and restore proper nasal breathing. This is because the roof of the mouth is the floor of the nose, so by expanding the palate you effectively widen the nasal passageway. Pediatric dentists and orthodontists screen for airway issues and refer for expansion starting as early as age 3 or 4 since much of jaw and facial growth happens by age 6. Orthodontic correction and expansion with traditional orthodontics can still be helpful in adults to correct bites and leave more room for the tongue. There are also newer, more sophisticated techniques such as Surgically Facilitated Orthodontic Therapy (SFOT), mini-implant supported (TAD) expanders, Surgically Assisted Rapid Palatal Expansion (SARPE) and the DOME technique, which can all allow adults to form new bone in the palate or on the front of the jaw. Jaw Surgery – In severe cases of sleep apnea, jaw surgery, known as Maxillomandibular Advancement (MMA), may be an option. Performed by an oral maxillofacial surgeon – OMS/OMFS – this form of facial skeletal surgery is done by making incisions in the bone inside the mouth to bring both jaws forward. This procedure leaves more space for the tongue and opens up the airway. It is often done in conjunction with orthodontics. Dr. Lamberton may also refer you to a Myofunctional Therapist, who can help strengthen the muscles of the face, lips, tongue, and airway to allow better nasal breathing and tongue rest posture during the day and at night. Our office is one of the few in the area with hygienists on our team who are trained in myofunctional therapy. Our hygienist Krista has taken advanced training in this field and has been doing myofunctional therapy for over a year. Myofunctional therapy addresses another possible cause of airway obstruction – muscle weakness of the tongue, mouth and upper throat. Treatment consists of a system of techniques and exercises to strengthen the muscles of the lips, tongue and airway and those used in chewing and swallowing. When these muscles are strong, they support effective nasal breathing, which can reduce symptoms of bruxism, snoring, and sleep apnea. Myofunctional therapy can be particularly effective in small children to help guide proper jaw and facial growth. It may be employed in conjunction with orthodontics, tongue and lip tie release and jaw surgery at any age. Some myofunctional therapists are also breathing coaches who can help patients learn to breathe correctly through the nose. Krista studied the Buteyko Breathing Method under Patrick Mckeown of the Buteyko Clinic International and is one of 16 accredited Buteyko Practitioners in California. Myofunctional therapists also are trained to make the proper referrals to medical and dental specialists. Myofunctional Therapy also can be useful to deter children from pushing their tongue against, and moving, their teeth, which can help avoid orthodontics or orthodontic “relapse.” Parents, too, are taught how to help their children eliminate bad habits like pacifier use, thumb sucking, or nail, tongue or cheek biting. If you think you have sleep breathing issues, discuss them with the dentist at your next visit. For more information, visit Krista’s website Second Breath OMT. It’s important to your quality of life to correct breathing problems as early as possible, and we will work with you to make sure you receive effective treatment. Jaws: The Story of a Hidden Epidemic by Sandra Kahn and Paul R. Ehrlich. Hands down the best dental office in Napa Valley! From the moment you call the office they make you feel comfortable and welcomed. Dr. Lamberton is an incredible skilled cosmetic dentist. He did my veneers almost 20 years ago and they are as beautiful as the day he placed them. I love this office! This is an amazing office. One of the best. It’s truly a pleasure to come to this office and be greeted by a smiling, friendly and well informed member of Dr. Lamberton’s dental team. Dr. Lamberton is an excellent dentist. He explained to me in detail his diagnosis, answered all of my questions and set up a treatment plan. My experience here has been wonderful and I give this office the highest recommendation.